What do frequency adverbs look like? 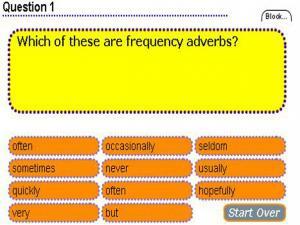 Do you know what words are frequency adverbs? This activity will help you learn. Read the questions below. Drag the correct answers to the space below the question. Try to find all of the correct answers. 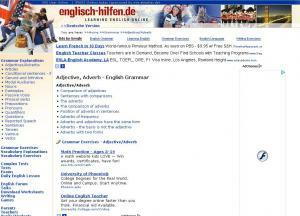 This page offers tutorials and exercises about adjectives and adverbs.Topics also include the uses of "so" and "neither", "no" and "not", and "good" and "well". Watch the video to see how adverbs of frequency are used in daily speaking, then read the extra notes giving more examples. There are 3 great exercises at the end to test your new understanding. 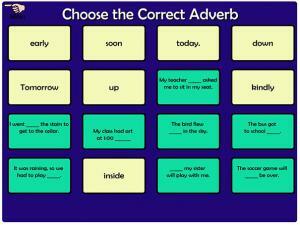 Learn about adverbs and what they do in a sentence. There are worksheets and a self-test for extra practice! Where does the adverb fit in a sentence? 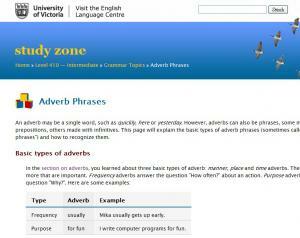 This tutorial explains and give examples about how to use adverbs perfectly. 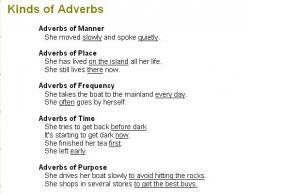 This page introduces some of the basic types of adverbs and their functions. Use the exercises for extra practice! Read the sentence. Look at each word in the box. Click on the box that has an adverb. Remember, an adverb always modifies a verb. How many can you get right? 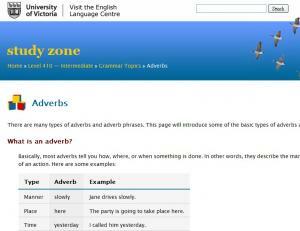 This is a site from the British Council to help you use adverbs in English. Read about the grammar rule, then play the two grammar games to help you practice. Rags to Riches: Answer questions in a quest for fame and fortune! 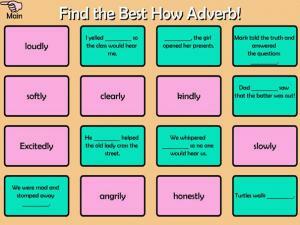 In each sentence, identify the adverb or adverbs. The more answers you get right, the higher up the winners table you go. You have 3 Hints to use along the way. Don't use them too early! 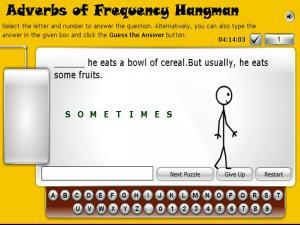 Play the classic game, Hangman but this time all the words are adverbs of frequency. Select the letter and number to answer the question. 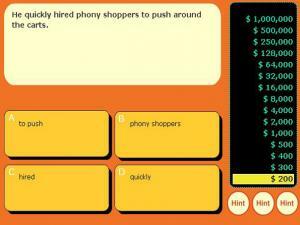 Alternatively, you can also type the answer in the given box and click the Guess the Answer button. 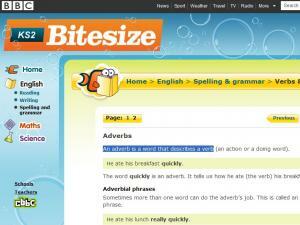 Adverbs are an essential part of constructing basic English phrases. 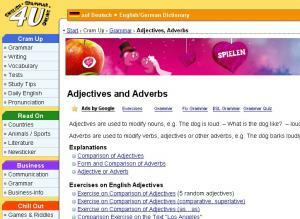 This site offers detailed information and examples of adverbs and adverb clauses. Watch this video lesson to learn more about how to use the word "during". Your conversation skills will improve! 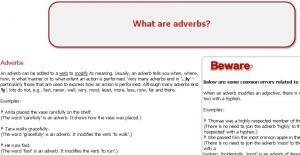 This tutorial covers adverbs giving many examples and good tips for avoiding common errors. There's a short self-test, too! Do you have a morning routine like showering and drinking coffee? Listen to this description and type the frequency words in the text. Great for all levels! 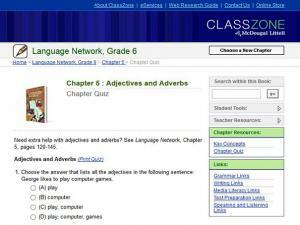 Includes links to special topics about adjectives and adverbs, especially of comparison and frequency. Try the link to practice exercises! 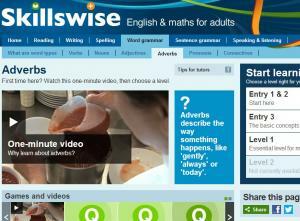 Use this site to improve your knowledge of adverbs. 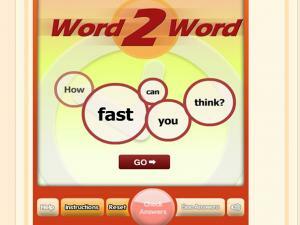 Test your knowledge by playing the game and completing the exercise! 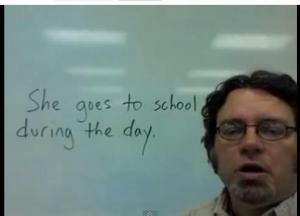 This video lesson explains the difference between adverbs and adjectives. You'll learn tips to remember which to use in different situations. 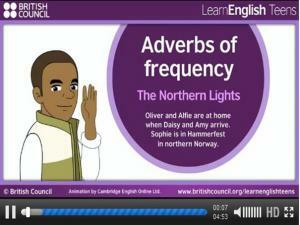 Do you want to practice using adverbs of frequency in English? 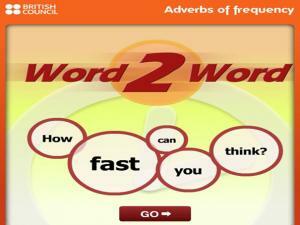 Play these British Council adverbs of frequency games and have fun while you learn.There are two games for you to play to practice using adverbs of frequency in English. This is a quick, fun game to check your understanding of 'how' adverbs. Read the sentences and decide which adverb completes the sentence. Click on each card and watch the correct pairs disappear. Go through all the cards until you have completed them all. Learn the difference between adverbs and adjectives and when to use them. Do the exercises for extra practice! Adverb Song: Do you qualify? A fun, fast video to help you identify adverbs and how to use them! 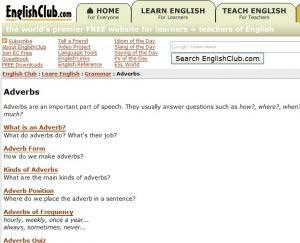 These short lessons will answer your questions about adverbs and how to use them. Take the quiz at the end for extra practice! Learn the basic types of adverb phrases (sometimes called "adverbial phrases") and how to recognize them. Do the exercises for extra practice! 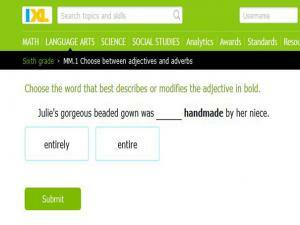 Choose the word that best describes or modifies the verb in bold. Once you are happy with your answer click the submit button. If you get an answer wrong, you will get a full explanation as to why and more examples to help your understanding. 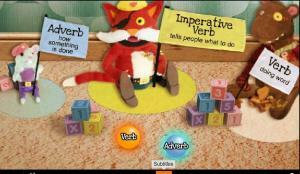 A more advanced game to check your understanding of different parts of speech, and in particular Adverbs. 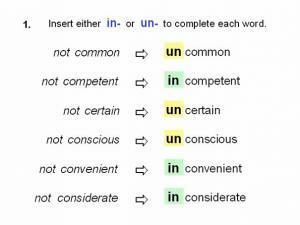 Read the sentence, then select the correct part of speech for the word underlined. 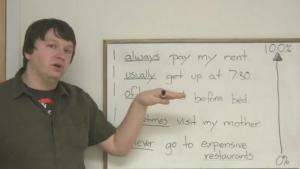 Learn to talk about your daily habits using adverbs. Listen to the discussion about living together and improve your conversation with roommates! 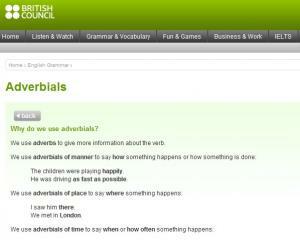 This page explains the types of adverbs and how to use them in sentences. Play the games to learn even more! Read the sentence in the box and match it with the best adverb to complete the phrase. How quickly can you match all of the adverbs to the right sentence? Comprehensive resource for practicing adverbs for manner, focus, place and time as well as adverb placement. 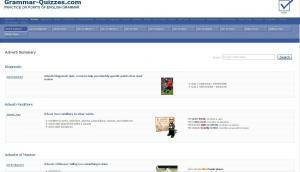 Includes detailed explanations and quizzes. 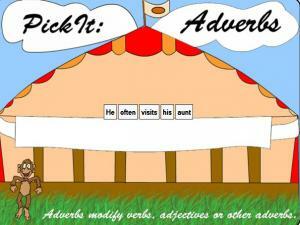 Adverbs are not always simple words or phrases; they can also be clauses, containing a subject and a full verb. 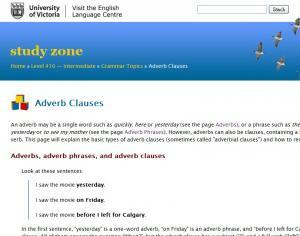 This page will explain the basic types of adverb clauses and how to recognize them. There are several exercises for practice. The exercise answers are available, if you can't seem to get a question right. 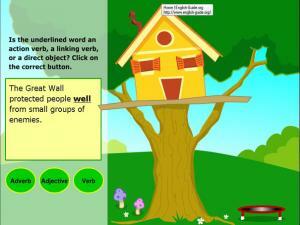 This is a test with 10 questions relating to the use of adjectives and adverbs. Read each one and choose one of the multiple choice options. At the end check your score and receive an explanation for each answer. 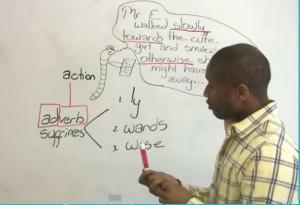 Watch this very simple, clear video lesson on how to form English Language exercise using the prefixes un- and in-. Look at the different words and see how they are correctly formed then test yourself to check your understanding. 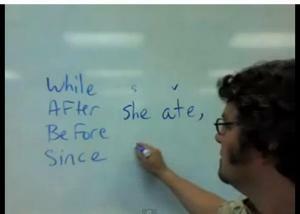 This video lesson teaches you how to change adverb clauses into adjectives phrases. Shorten your sentences and sound more like a native speaker! 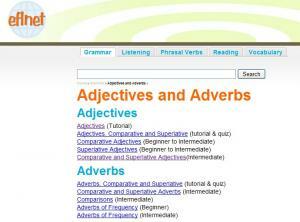 Learn about the most common adverb suffixes in English in this advanced grammar lesson. Practice using -ly, -wards, and -wise.